Will 2017 be the year politicians produce more than talk for infrastructure investment? This post was also published on Bloomberg Government on December 21, 2016. Words are cheap, though. And top congressional Republicans are skeptical about Mr. Trump’s ambitions. So the question for 2017 is whether all the chatter about infrastructure will produce more than talk. The economic case for stepped up government investment, broadly defined to go beyond bridges and water pipes to include software and government-sponsored research and development, is simple. With U.S. productivity growth distressingly slow and lots of U.S. businesses sitting on their cash instead of investing it, this would be a good time for the government to invest more on things that (we hope) will pay off in faster economic growth in the future. 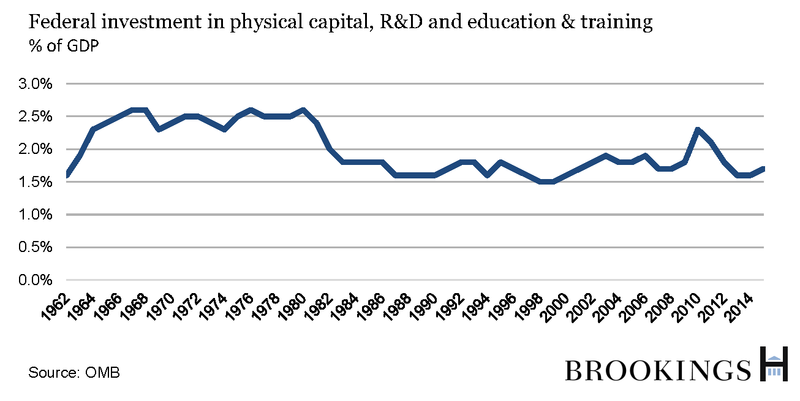 After all, government investment spending has been on a downward trend for years. Looking at local, state, and federal governments combined, the U.S. Bureau of Economic Analysis says that net public investment – spending on new infrastructure minus the deterioration of old – is now running at just 0.5 percent of GDP, well below the historical range of between 1 percent and 2 percent of GDP. The Hutchins Center Explains: How worried should you be about the federal debt? That $310 billion works out to 1.7 percent of GDP, roughly in line with what the federal government has invested for the past couple of decades but well below the 2.5 percent of GDP that Washington invested annually from the late 1960s to the early 1980s. If you accept that the government should invest more, then you confront two big questions: How to pay for it? And how to make sure the money goes to projects most likely to pay off? At a time when interest rates at which the U.S. Treasury borrows remain low (even though they’ve risen a bit lately), there’s a strong case for borrowing more now to invest in worthwhile projects that make sense. If not now, when? But with the federal debt swollen by the cost of rescuing the economy from the Great Recession, there is also a case for paying for more public investment today by cutting spending somewhere else or somehow raising revenue. One approach popular with some members of Congress from both parties is to pay for a big infrastructure program with a one-time windfall that would come from reforming the corporate tax code so that companies bring back a lot of profits parked overseas. But many Republicans prefer to use that windfall to pay for reducing the corporate tax rate. Congress could raise taxes – say, hiking the gasoline tax, which funds federal highway spending – but that seems unlikely in the current political climate. Republicans and Democrats are flirting with schemes that would essentially leverage federal spending or tax breaks to lure more private money – from, say, pension funds – into infrastructure projects. This approach works generally only for projects that lend themselves to tolls or other revenue streams so that private investors are assured a flow of money to pay them back. Replacing the nation’s lead water pipes may be a very sound investment in children (given the documented damage that lead does) even if it isn’t possible to raise municipal water rates sufficiently to cover to the cost. Some members of Congress would use an antiticpated windfall from corporate tax reform to fund a burst of infrastructure spending. Trump campaign advisers Wilbur Ross (now Commerce Secretary-designate) and economist Peter Navarro outlined an approach during the campaign that relied on offering tax credits to private investors who put money into infrastructure projects, but that plan has met with more criticism than support. Perhaps a bigger challenge than finding money for public investment – after all, the federal government can borrow at lower rates than almost any other entity on Earth – is directing that money to truly worthwhile projects, not only those that are politically popular. That’s difficult in any democracy. It’s especially difficult in the U.S. given the composition of the U.S. Senate with two seats for every state regardless of population, which leads to formulas that spread investment spending across the country. Frustration about this has led to proposed mechanisms that would limit politically mandated formulas or earmarking. Congress, for instance, has appropriated $4.6 billion since it created the Transportation Investment Generating Economic Recovery (TIGER) program in 2009 under which the U.S. Department of Transportation is supposed to choose among competing transportation projects of all sorts and money is supposed to flow to the ones with the biggest bang for the buck. (Whether it worked as hoped for is another matter. The Government Accountability Office was skeptical.) Proponents of public-private partnerships or a federally financed national infrastructure bank often design them so that the people who pick projects to fund are, at least in part, insulated from political pressures. Infrastructure spending traditionally has been popular in Congress: It brings highly visible projects to Members’ districts. And Congress did pass a bill in December 2015 that provides for more than $300 billion in highway, transit, and rail spending over the next five years.